Gold was choppy overnight in a range of $1329.90 - $1337, fading movements in the dollar (DX from 89.37 – 89.75). Early during Asian hours, gold rallied to its high, taking out resistance at $1331-32 (double top, 2/7 and 2/13 highs, down trendline from 1/25 $1366 high) as the DX slid to support in front of its 2/6 low at 89.36 from a stronger yen (107.89 -106.85) - despite a miss on Japanese GDP. During European time, gold retreated back to $1330 as the dollar strengthened (DX back to 89.75) against the euro, as the common currency was pressured by a weaker than expected reading on German GDP (euro from $1.2385 - $123.40). A rebound in the US 10-year bond yield (2.808% - 2.844%) and mostly firmer global equities were a headwind for gold with the NIKKEI off 0.4%, the SCI up 0.5%, European markets were +0.7% - 0.8%, and S&P futures were +0.5%. However, a pullback in oil (WTI from $59.20 - $58.59) from larger than expected builds in US oil and gasoline inventories from yesterday’s API Report weighed on equities. Markets had an initial violent reaction (heavy algorithmic activity), as the S&P futures collapsed (2675 – 2628), and the 10-year yield spiked to 2.891%. 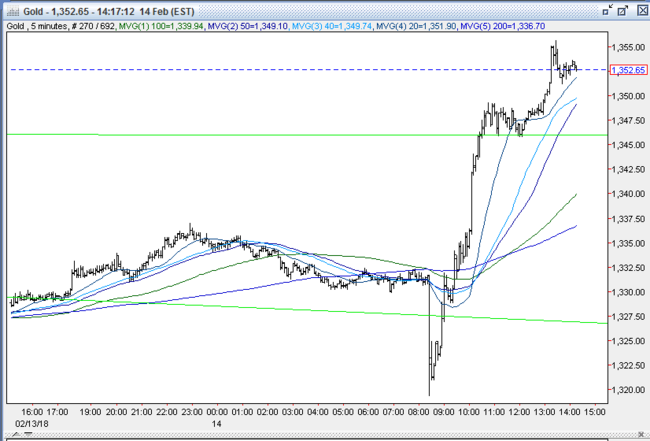 The DX shot to 90.13, and gold was whacked down to $1319. However, within two hours, US stocks recovered (S&P +15 to 2678), with banks and tech leading the rebound. US 10-year yield continued to climb, though, and reached a fresh 4-year high at 2.904%. The dollar turned down sharply, taking out its overnight low and support at 89.36 to reach 89.23. Gold rocketed past mild resistance at $1331-32, and then ran through a vacuum to another patch of mild resistance at $1346 (2/6 high). It pushed through that to reach $1349 by late morning, where resistance at the triple top at $1350-52 (1/29, 2/1, and 2/2 highs) held. Into the afternoon, US stocks continued to advance (S&P +27 to 2690), helped by a rebound in oil (WTI from $58.19 - $59.78, EIA reported a smaller than expected build in US oil inventories). The 10-year yield ticked up further to 2.911% (another 4-year high), but the DX sank to 89.05, pressured by a firmer euro ($1.2441) and pound ($1.4006). 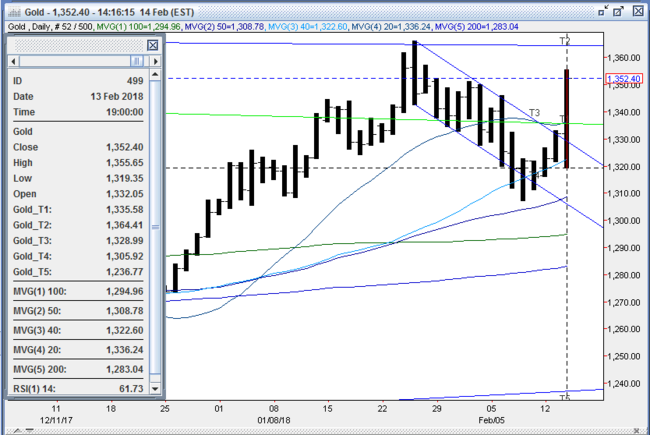 Gold continued to climb, and took out resistance at $1350-52 to reach $1355.65, just shy of its 1/26 top at $1357. Open interest was up 1.6k contracts, showing a net of new longs from yesterday’s gain. Volume was lower with just 213k contracts trading. All markets will continue to focus on the volatility in the equity and bond markets, geopolitical events, developments with the Trump Administration, corporate earnings, oil prices, and will turn to reports tomorrow on Japanese Industrial Production, Eurozone Trade Balance, US Empire State Manufacturing Index, Jobless Claims, PPI, Philly Fed Index, Industrial Production, Capacity Utilization, and the NAHB Housing Market Index for near term direction.